​The primary objectives of the GDPR are to give control back to citizens and residents over their personal data and to simplify the regulatory environment for international business by unifying the regulation within the EU, to strengthen and unify data protection for all individuals within the European Union (EU). A person shall be able to transfer their personal data from one electronic processing system to and into another, without being prevented from doing so by the data controller. Both data that has been 'provided' by the data subject, and data that has been 'observed' — such as about their behaviour — is within scope. The data must be provided by the controller in a structured and commonly used Open Standard electronic format. Your data may be collected and used only under strict conditions and you must always be informed about the intention to collect and use your data. Data controllers must respect your rights while processing personal data entrusted to them. You have the right to ask for the deletion, blocking or erasing of the data. Decisions that can significantly affect your life, such as granting loans or insurance, are sometimes taken on the sole basis of automated data processing, data controllers must adopt suitable safeguards, such as giving you the opportunity to discuss the thinking behind the processing of the data or to contest decisions based on inaccurate data. If you believe your data protection rights have been breached, you may also submit an official complaint. If a data subject is of the view that his/her data has been compromised, he/she can send a complaint to the data controller. If the data controller's handling of a complaint is not satisfactory, the data subject can file a complaint to the national supervisory data protection authority. Every EU country must provide one or more independent supervisory authorities to monitor its application, all data controllers must notify their supervisory authorities when they process personal data. The new EU data protection regime extends the scope of the EU data protection law to all foreign companies processing data of EU residents. It provides for a harmonization of the data protection regulations throughout the EU, thereby making it easier for non-European companies to comply with these regulations. 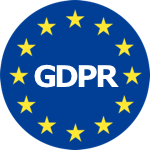 GDPR becomes enforceable from 25 May 2018, unlike a directive, it does not require any enabling legislation to be passed by national governments and is thus directly binding and applicable. A single set of rules will apply to all EU member states.